In solidification reaction substances changes from a liquid to a solid when its temperature is lowered below its freezing point. It is also known as freezing. Animal fats and vegetable oils are esters of carboxylic acids. These fats and oils are called triglycerides. Triglycerides reacted with sodium or potassium hydroxide to produce fatty acid salt and glycerol. The salt of fatty acid is called soap. *Saponification process is a hydrolysis reaction. *Soap is produced by saponification of a triglyceride. *Soap is a salt composed of a mixture of carboxylate anion and univalent cations. *Sodium hydroxide produce hard soap. *Potassium hydroxide produce soft soap. *Potassium soaps are more soluble than sodium soaps and readily produce lather. into a grease to forming micelles around oil droplets. 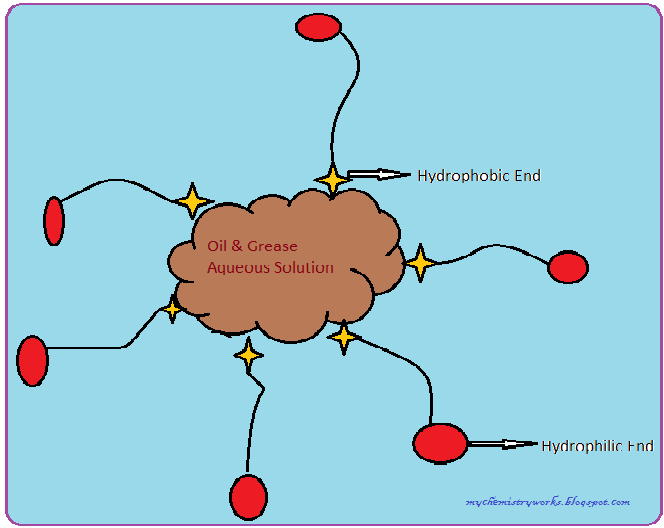 The hydrophobic ends of the soap molecules attached towards the grease while the hydrophilic ends of the soap face outward into the water, resulting is an emulsion of soapy grease particles suspended in the water. Then the oily particles are easily washed away. The water agitation can help to clean greasy and oil. The micelles are dispersed into the water. Soap do not work well in hard water. Hard water containing calcium and magnesium ions. these ions react with soap to form an insoluble precipitate known as soap film. This precipitate is often seen as a gray line on a bathtub or sink and is often called scum. Detergents are similar to soaps. They work in both soft and hard water. The detergent removes the oil film and the dirt can be washed away. Substance changes from a liquid phase to solid phase when its temperature is lowered below its freezing point. it is also known as freezing. Triglycerides reacted with sodium or potassium hydroxide to produce fatty acid salt and glycerol. Iron combine with oxygen in the presence of water molecule to form a iron oxides. (rust). Energetic molecules (hydrocarbons) combine with oxygen to produce carbon-dioxide and water. Respiration helps to breaks down glucose into carbon-dioxide and water. www.chemistryworks.net. Simple theme. Powered by Blogger.